The jeans that everyone is talking about have been featured in People Stylewatch. 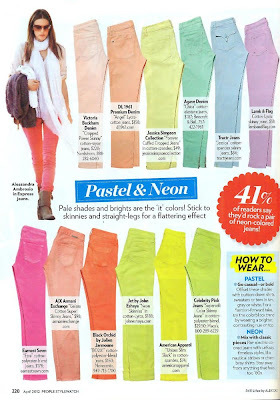 DL1961 has been making waves not only with their bright colors, but with their incredible fit! If you haven't jumped on the bright jean bandwagon, there's no time like the present. This is a hot trend that can work for everyone - whether you decide to offset these shades with neutrals, or go for a color block contrast! Keep it fashion forward by pairing these pants with timeless prints like nautical stripes...steer clear of anything that looks too 80's! Fit tip: staight and skinny are the most flattering fits if you're going bright.